Topics include Indiana's lakes and rivers, drive-in theaters, and the Lincoln Highway. 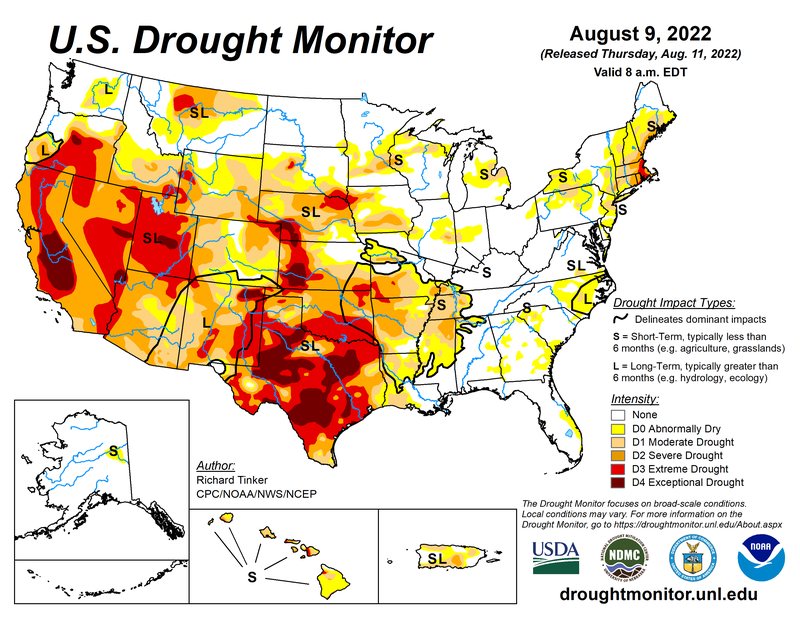 Images are automatically updated by the U.S. Drought Monitor. * Ripley County did not confirm WNV mosquitoes, even though it has a human infection. This person may have contracted the WNV from another county and state. Colored grey in the county map below, the four non-WNV counties are Dearborn, Jennings, Orange, and Switzerland. Minnesota is known as the Land of 10,000 Lakes; there are actually almost 12,000 major lakes (lakes larger than 10 acres) in the North Star State. In a sense, Indiana likely has over 10,000 lakes as well...only if the tiniest ponds are included! Most natural Hoosier lakes are found in the northern counties, where kettle lakes dot the landscape thanks to the melting and land-shaping glacial ice. 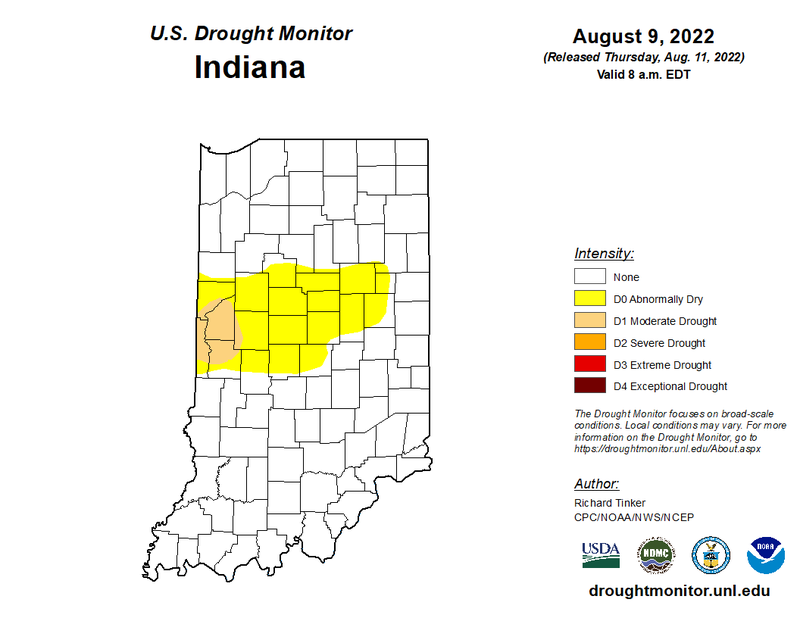 The state's human-created, artificial reservoirs are mostly found in Southern Indiana. However, this region boasts dozens (if not hundreds) of karst lakes. This is a type of freshwater lake in which water wells up from under ground to permeate and flow above soft, porous limestone and other minerals. Some Southern Indiana lakes are known for their strikingly jagged valley patterns. 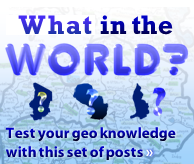 The following list is a comprehensive overview of major lakes in each county. For disclaimer purposes: some lakes listed below might be inaccessible, part of privately-owned land, or unsuitable/unsafe for recreational purposes (swimming, fishing, etc.). Some counties are lacking when it comes to recreational, publicly accessible lakes. Access this water quality post (↗) to learn about lakes experiencing severe eutrophication, a process that encourages too much algae growth and may deprive fish of vital oxygen levels. 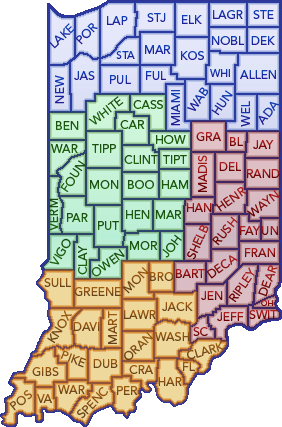 This section of the All About Indiana page was mostly compiled with the use of Google Maps, lakes data from the IndianaMAP GIS layer/shapefile (maps.indiana.edu/index.html), and GeoNames. Lake Holiday and an unnamed lake in NE Jasper Co.
Allen, Banning, Barrel-and-a-Half, Beaver Dam, Beigh, Barbee (Big and Little), Black, Caldwell, Carr, Crystal, Dewart, Diamond, Durham, Fish, Goldeneye Pond, Goose, Grindle, Hammond, Heckman, Heron, Hill, Hoffman, James, Jamison, Kiser, Kuhn, Larrew, Little (North and South), Little Chapman, Long, Loon, McClure’s, McPherson, Morehead, Mud, Muskellunge, Palestine, Papakeechie, Pierceton, Pike, Pisgah, Price, Read, Reed, Ridinger, Rock, Rothenberger, Sawmill, Schultz, Sechrist, Seller’s, Sheely, Sherburn, Shock, Shoe, Sickle, Snoke, Spear, Stafford, Stanton, Stevens, Tennant, Tibbitts, Tippecanoe, Waubee, Wawasee, Webster, Whyland, Wyland, and Yellow Creek Lk. Elkhorn Lakes, Glen White, Hi-Way Springs Lakes, Middle Fork Reservoir, Osborne Lakes, Scout, several unnamed lakes, and We-Hi Lk. 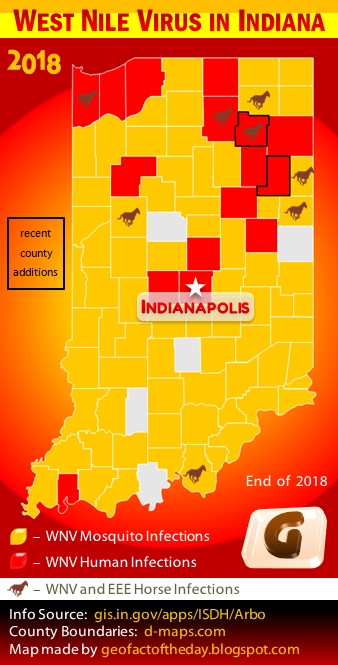 There are 92 counties in Indiana. They are listed below in alphabetical order. For the purpose of organizing the counties in my map, I've formed four sections that each have 23 counties. Number in parentheses represents the license plate prefix (number) of each county. 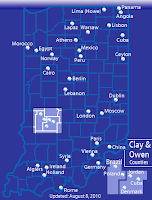 There are over 30 towns in Indiana that have names of a country or a country’s capital. These are listed below in alphabetical order, and they are shown on the Google Maps interactive map above and GeoFact of the Day image to the left.